In this life-size game of Clue, six psychiatric patients in Paris's Saint Anne's Hospital are suspects in the murder of Dr. Black. Though Not a Clue tells the stories of these possible assassins, their lives, and what has brought them to the hospital, the true focus of Chloé Delaume's intense and tumultuous novel is not merely to discover the identity of the murderer. 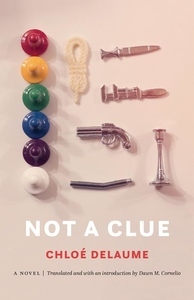 Rather, by cleverly combining humor with the day-to-day effects of life's unrelenting compromises, Not a Clue is an astute commentary on the current state of literary production and consumption. Masterfully juggling an omniscient narratrix, an accusing murder victim, at least six possible suspects as well as their psychiatrists, and a writer who intervenes by refusing to intervene, Delaume uses the characters, weapons, and rooms of the board game Clue to challenge--sometimes violently, sometimes playfully--the norms of typography, syntax, and narrative conventions.